The House of Commons and the House of Lords combine to form Britain's Parliament. Charles Townshend was a member of the House of Commons when he convinced Parliament to impose a new tax on the American colonies in 1767. "Nervous tension" is the term that best describes the relationship between the American colonies and England in the aftermath of the Stamp Act repeal. Several issues remained unresolved. First, Parliament had absolutely no wish to send a message across the Atlantic that ultimate authority lay in the colonial legislatures. Immediately after repealing the Stamp Act, Parliament issued the Declaratory Act. This act proclaimed Parliament's ability "to bind the colonies in all cases whatsoever." The message was clear: under no circumstances did Parliament abandon in principle its right to legislate for the 13 colonies. In the Western Hemisphere, leaders were optimistic about the repeal of the Stamp Act but found the suggestions of the Declaratory Act threatening. Most American statesmen had drawn a clear line between legislation and taxation. 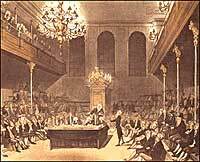 In 1766, the notion of Parliamentary supremacy over the law was questioned only by a radical few, but the ability to tax without representation was another matter. The Declaratory Act made no such distinction. "All cases whatsoever" could surely mean the power to tax. Many assemblymen waited anxiously for the issue to resurface. As Britain continued to impose taxes on the colonists, reactions turned violent toward tories and British officials. Sure enough, the "truce" did not last long. Back in London, Charles Townshend persuaded the House of Commons to once again tax the Americans, this time through an import tax on such items as glass, paper, lead, and tea. Townshend had ulterior motives, however. The revenue from these duties would now be used to pay the salaries of colonial governors. This was not an insignificant change. Traditionally, the legislatures of the colonies held the authority to pay the governors. It was not uncommon for a governor's salary to be withheld if the legislature became dissatisfied with any particular decision. The legislature could, in effect, blackmail the governor into submission. Once this important leverage was removed, the governors could be freer to oppose the assemblies. Charles Townshend, Chancellor of the Exchequer, sponsored the Townshend Acts. 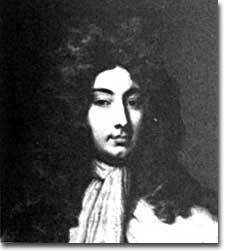 He believed that the Townshend Acts would assert British authority over the colonies as well as increase revenue. Townshend went further by appointing an American Board of Customs Commissioners. This body would be stationed in the colonies to enforce compliance with tax policy. Customs officials received bonuses for every convicted smuggler, so there were obvious incentives to capture Americans. Given that violators were tried in juryless admiralty courts, there was a high chance of conviction. Townshend also pressed the Americans to the limit by suspending the New York legislature for failing to provide adequate supplies for the British troops stationed there. Another showdown appeared imminent. Reactions in the colonies were similar to those during the Stamp Act Crisis. Once again nonimportation was implemented. Extralegal activities such as harassing tax collectors and merchants who violated the boycotts were common. The colonial assemblies sprung into action. First, That we will not send for or import from Great Britain, either upon our own account, or upon commission, thisfall, any other goods than what are already ordered for the fall supply. In a circular letter to the other colonies, the Massachusetts legislature recommended collective action against the British Parliament. Parliament, in turn, threatened to disband the body unless they repealed the letter. By a vote of 92 to 17, the Massachusetts lawmakers refused and were duly dissolved. Other colonial assemblies voiced support of Massachusetts by affirming the circular letter. The Massachusetts Cicular Letter was penned by Samuel Adams in 1768. It voiced Massachusetts opposition to taxation without representation and was sent to several colonial legislatures inviting them to unite in their actions against British government. In response, Lord Hillsborough warned colonial legislatures to treat the Circular Letter with contempt and threatened dissolution to any legislative body that adhered to Massachusetts' plea. His words fell on deaf ears as legislative assemblies throughout the colonies, including New York, Rhode Island, and New Jersey, rose to the occasion and accepted the petition set forth by Samuel Adams and Massachusetts. The tighter the British grip grew, the more widespread was the resistance. By 1769, British merchants began to feel the sting of nonimportation. In April 1770, news of a partial repeal — the tax on tea was maintained — reached America's shores. The second compromise came at a high price. It was reached only after a military occupation of Boston and the ensuing Boston Massacre. Responsible for taxing the Americans and leading Britain to war with the colonies, King George III lost more than the American colonies — he also lost his sanity. For more information, check out this brief biography on the British monarch from Britannia. Virginian George Mason was involved in the American Revolution from the issuance of the Royal Proclamation of 1763 through the signing of the Declaration of Independence. Along with George Washington, Mason drafted Virginia's non-importation resolutions in response to the Townshend Acts. George Mason's home, Gunston Hall Plantation, is now a National Historic Landmark with a beautiful and comprehensive website that address Mason's life, especially his contributions throughout the American Revolution. Were the British being unreasonable in their attempts to tax the American colonies? Did the colonies overreact to the acts and taxes imposed by Parliament? This website from the University of Groningen in the Netherlands offers a detailed look at the rights of Parliament to tax the colonies. From the Sugar Act of 1763 through the Intolerable Acts. The site also includes a section on the Townshend Acts. The Townshend Acts were actually a series of taxes and laws imposed upon the colonists. The first, the Townshend Revenue Act, placed a tax on glass, paint, oil, lead, paper, and tea. Other bills included in the Townshend Acts contributed to the colonists' angry reaction. This Carleton University website provides the texts of the Townshend Revenue Act, the New York Suspending Act, and documents American colonists created in response to the British laws. 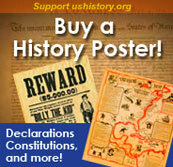 And, don't forget about the women in the Revolutionary War era! The colonies' nonimportation agreement hit Britain right where it hurt — in the pocket. By 1769, colonial exports exceeded imports by over £800,000.